I borrowed this book from a colleague at work and as such can't quote directly from the text, or even go back to prove I've not made a whole heap of stuff up–darned memory is playing up these days yes siree and so forth. But as near as I can remember, this little ripper is set in prohibition-era [insert redneck country town here], and is the story of one man who, thanks to strongly held principles and damned ornery stubbornness, goes to war with bootleggers over his father's not-so-secret stash of eight-year-old moonshine whisky. And that's pretty much it. Of course, if you dig a little you'll come to realise it's a perfect example of Leonards own rules of writing. Nothing is extraneous; each sentence pushes the narrative onwards through the dramatic crisis and explosive finalé. No-one expounds, anguishes, gasps or grumbles; they merely say what they have to say. Characters are never described except by other characters. And at no time does it ever sound like writing. Son Martin lives alone except for his friend (who I choose to remember was called Amos), a black man whose very existence is an affront to at least two of the antagonists. He distills some of the best darned clear moonshine in all of [insert redneck county here], something that gets him the attention of the local sheriff and his army of 'deputies' who enjoy 'raiding' his still every now and then to get loaded. His pappy lies in a grave on the property, his wife is dead, and his mistress runs the hotel in town. And he's sitting, so they say, on a fortune in aged whisky that his pappy made near enough ten years ago. But he's only gone and blabbed this secret to an army buddy, so it transpires, while drunk and vulnerable when he was still in the service; a buddy who comes looking for it, and brings a hostile posse of bootleggers along with him. I recall an Alan Alda movie version, but only poorly. It can only have been played as a comedy, and in truth there are comedic moments in the book–it's not all cussin' and spitting and inscrutable stares and casually slung shotguns invoking death at a moment's notice. At one point Son looks out across his property at the trees wherein hides an army of shotgun toting bootleggers to see what he thinks is the cavalry come to his aid. In truth it's the locals, come with picnics and lemonade to watch the show. But at heart this is an all-action thriller. In the timeline of Leonard's work, it comes after the bulk of his Western novels, and before his more contemporaneous work, but it could easily belong to either category or exist on its own. 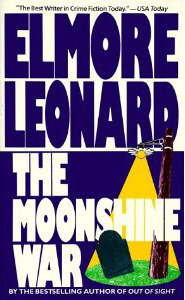 Either way, it is quintessential Elmore Leonard, and I put him up there with John D. MacDonald as one of the most consistently entertaining American writers of thrillers and action, one to which I will return again and again until his work is exhausted. Then I'll go back and start again.